So, particularly for folks whose bubbly beverage is an IPA, let’s get a couple of Sparkling Wine 101 things out of the way. Not all sparkling wine is Champagne; in fact most of it isn’t. To be called Champagne, your wine must come from the Champagne region of France, it must be made by a strict method, and it may only contain one or more of three grapes: Pinot Noir, Pinot Meunier, and Chardonnay. Tweak any of those criteria one little bit and you’re not Champagne. Terminology: “Blanc de Blanc” means a white wine made from white grapes (so in this region, 100% Chardonnay). “Blanc de Noirs” means a white wine made from black Pinot grapes without any skin contact to give it a tint. “Rosé” is pink, and can be varietal Pinot Noir, or a combo of Pinot Noir with Pinot Meunier and /or Chardonnay. “Non-vintage” means the wine in the bottle didn’t come from one single harvest year, but a mixture-a common practice in Champagne and by no means an indicator that you’re drinking a lesser product. “Vintage” means the grapes all came from the same place and at the same time. I am not specifying vintages here unless it matters for some reason; the point of these bottles is that the producers are really dependable and whichever release is on the shelves, it’ll do right by you. “Cuvée” can mean a lot of things but in high end producers, expect it to mean a special, high-quality blend. Good? Good. Oh, also? Taste is subjective and has nothing to do with price points. Champagne is, by and large, really expensive, and while much of it is amazingly good, you’re also paying a huge premium for the cachet of the name. 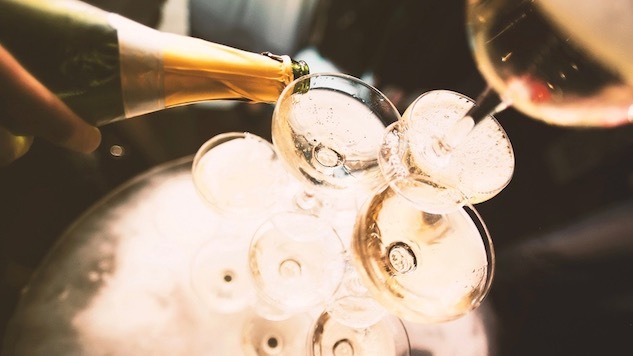 Wine regions all over the world make completely world-class sparkling wine for a fraction of the price of many Champagnes (check out our list here). That’s what “Champagne tastes” means: That someone just gravitates toward the expensive stuff. Savvy wine buyers know they don’t have to shell out for vintage Krug to be confident they’re going to be pouring something great. That said, if you have a bottle of Krug hanging around, what are you waiting for? Pop the cork! Below are some of the stars of the Champagne region. This list is by no means exhaustive, but we’ve tried to cover a little bit of everything, from the Ridiculously Affordable to the Big Guys. Sometimes things are just pretty. This is an example. Elegant, refined and clean, with a crystalline pale gold color and long beading. Pleasant chalkiness, notes of apricot and raspberry. Perfect acidity and a lively, appealing finish full of candied lemon peel. This is a world-class seafood wine but certainly cannot do you wrong as an aperitif. “Champagne prices have a tendency to swing drastically as the large champagne houses reposition themselves during the holiday season, but generally this one comes in at $10-15 less than Veuve Clicquot,” says Certified Sommelier Yashar Shayan, and founder of Impulse Wine. On the nose: aromatic pears and hints of raspberries. On the palate: light cherries, fresh peaches and a creamy finish evoking buttery pastry. An all-Chardonnay Champagne with a lot of really great florals. Acacia and honeysuckle dominate. Notes of apricot, pastry, and almond, a little hint of candied ginger. Extremely fresh, a tiny bit steely. Really well structured. The obvious choice with this is a big plate of oysters, but that’s true of a lot of sparkling wines: Just because you shelled out doesn’t mean it has to be shellfish. I’d be totally cool putting this next to a perfectly seared rib eye and some fingerling potatoes. Andy Hale of Sour Grapes in Asheville, N.C., calls this one of the most affordable grower champagnes he’s ever seen. A blend of 65% Chardonnay and 35% Pinot Noir gives this wine a rich, luscious texture (one of Chardonnay’s hallmarks) with a beautiful floral flavor (thank you, pinot!). Triolet farms in a traditional method called Lutte Raisonée, which is similar to U.S. organic farming. This is truly a champagne that must be tasted to be believed. It tastes far more expensive than it is and is a great draft pick for a debonair, understated dinner party contribution that will make everyone feel treated to something special. Whether Champagne is truly an aphrodisiac remains a subject of debate, but if you’re looking for a love potion, or a sparkling wine to fall in love with, this is a pretty great one. (P.S., if you’re on your own, this wine will happily be your date.) Intense nose, with fresh raspberries leading, along with assorted florals. On the palate the wine is balanced and exceedingly well-structured. Strong red berry notes courtesy of a pinot majority in the blend (I get a ghost of something citrusy too), beautiful delicate rosy hue, persistent mousse, a delicate creaminess. 2008 was a great year for Champagne, but if you find one from a different vintage, you’re in for treat regardless. This is a classic Champagne house and this bottle makes a classy, classic Valentine’s day wine. Use it as an excuse to stay the hell out of restaurants! This Blanc de Noirs is an absolute classic, a straightforward and fruit-forward Champagne, full-bodied and a bit fleshy. Juicy, opening on pear notes and a little bit of something gingery, plums, a little bit of pie crust and a grapefruit-dominant finish. This is not an austere wine, nor is it particularly exotic. It’s a Little Black Dress Champagne—goes with everything, always in style, appropriate for any occasion. Excellent gift. Including to yourself. Chardonnay, Pinot Noir and Pinot Meunier (an unusually high percentage of the Meunier, around 40%). This is the real deal, a true Champagne with an ancient lineage, but a more affordable bottle than the House’s signature “Belle Epoque.” Light, elegant and lively, this wine carries a good deal of lemon and lime zest on the nose and tart berries on the palate. It’s clean, versatile, and lovely. It’s not so precious you feel like you can’t open it, and it will elevate a festive occasion-or make a mundane one feel festive. This biodynamically farmed cuvée Champagne would most appropriately be placed in the “Le Charm-Bomb” style of French sparklers. It’s incredibly festive, very versatile, and has a sort of wittiness to it. (Please don’t ask me how it is that wine can have or not have a sense of humor, but trust me, it’s a thing, and frankly not everything that comes out of Champagne has the ability to laugh out loud.) It’s a Chardonnay, and its main expression is grapefruit and crushed stone, but there’s a healthy ration of orchard fruit notes too, including aromatic quince. Dry but faintly honeyed, with a beautiful bead and a skin-tight finish. Focused but don’t expect it to take itself overly seriously. You can get that from plenty of Champagnes. Come to this one for a break from all that. Finesse for days, non-snooty. Gnocchi would enjoy a night out with this. This is a very affable wine, and while it’s more of a splurge than, say, a Spanish cava, it’s far from the priciest bottle on this list. On the delicate side, crystalline and almost silvery in the glass, meandering, unending bubble-streams. A tad shy on the approach but the nose unfolds into a floral and white nectarine and pear thing, and with a little time, starts to show complicated notes of riper fruit, and savory spices (like curry? Maybe fenugreek?). Dry and fresh with a light finish. A bit reserved, but a great friend once it opens up. Try it with something that echoes those spice notes or just enjoy it as an aperitif. This Champagne flies a bit under the radar. But bring it as a host gift if the host in question is a wine connoisseur and you will secure a permanent spot on that person’s guest list. It is a wine-geek’s wine. Nose of peaches, piecrust, almond or marzipan and a little sweet cherry. A kind of lemon curd thing unfolds on the palate, along with tart green apples, orange rind, mineral notes and spice. Deep, deep depths to this stuff and a molten-gold color that’s totally gorgeous. It’s a complex and impressive concoction and absolutely as good as or better than plenty of champagnes for which you shell out a good deal more. The term “Millesime” is common in perfumery; in describing Champagne it means the same thing: extra-high quality. And this is some pretty fine stuff. Be careful opening this one if you’re flying solo: You will drink the entire bottle and then start sending racy text messages to your ex by accident. Sleek, structured, finesse in a glass. Straw color, lovely aromatics (violets and strawberries), persistent perlage, and pleasant mix of fruity and pastry-like notes. A beauty. Broadly food-loving but I happen to like this one best paired with an empty house and a movie I didn’t have to negotiate with anyone about. See, this is a really good example of “it’s personal,” sub-clause “I only tried it once and I recognize it’s fabulous but I can’t really afford it, which inherently makes it less good for me personally.” Many people venerate this Champagne. It deserves a high rank for its complete awesomeness, but I get more excited about makers like Lucien Albrecht or Boschendahl, who make utterly delicious wines you can actually drink without taking out a home equity line. If you’re the kind of person who can drop $300 on something you will, let’s just say it, turn into pee, then you know what? Skip the Dom Perignon and the Cristal and whatever else, and get this. It’s a pretty kowtow-worthy wine. It’s a sucker punch with a huge towering presence, incredible complexity, and serious aging power. Notes dominant in this vintage now? Nougat, caramel, roasted nuts, candied citrus zest, ginger, pastry, and a long lime finish. Rich and luxuriant with intriguing salinity. Deep gold color, unapologetic opulence. Try it at least once. Especially if someone else is paying for it! This wine is the Emperor of “I am the occasion” special-occasion wines. I knew someone whose dad bought a high-end Napa Cabernet from the year she was born and opened it with her on her 21st birthday. This is a wine I’d do that with. If you like your Champagne on the intense side with a slightly less intense pricetag, this is your guy. There’s an immediacy and power to this stuff. Apricot tone in the glass, beautiful bubbles, massively aromatic nose reminiscent of strawberry jam, baking spices and honey. Creamy mouthfeel, and a highly nuanced and rather eccentric palate—plums, piecrust, blackberries—I even get some rather unexpected spice notes; Is that cumin? Fennel? Before you figure it out it reveals a deeper layer that expresses tea, figs, and pink peppercorns. If that list of aromatics sounds odd or intimidating, don’t sweat it—it’s amazingly seamless and, with all due respect to La France, the stringent regulations on what you can call Champagne result in consistent greatness but also … predictability. There is a certain limited range of flavors. Heidsieck has managed a very surprising one here. So … if you’re planning to surprise someone special, this might be the moment to pop the cork on a bottle of this nectar.